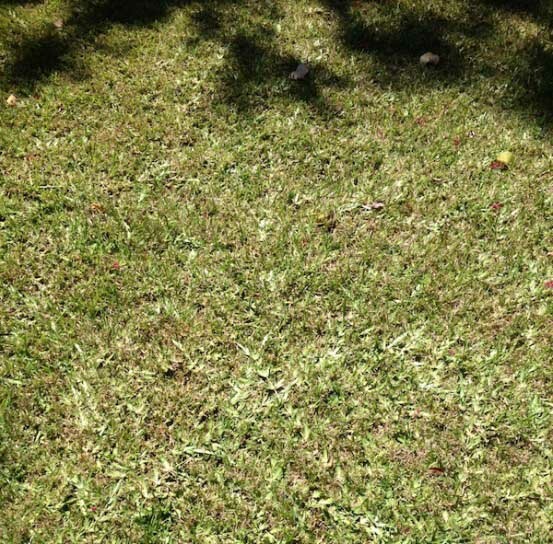 Have you noticed swaths of your lawn that appear to have been chewed down to a nub? Or, maybe you’ve noticed gray and white moths flying around your lawn. Both are signs that you could have an infestation of armyworms. From August through November, we typically see an increase in these small yet destructive pests, especially in St. Augustine lawns. 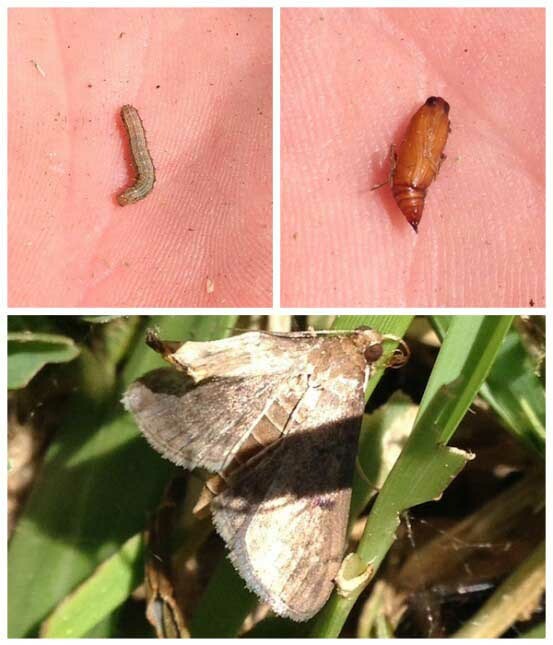 There are 4 stages of an armyworm. Egg, larva, pupa, adult moth. The armyworm is a native insect whose larvae can cause a lot of destruction in a short amount of time. The adult moths lay their eggs in your lawn or lush areas of vegetation. A female moth can lay up to 200 eggs! They prefer moist areas so fall rains often encourage larger populations. Once the eggs hatch and the larvae emerge, they “march” in pairs next to each other feeding on and damaging your grass. This marching behavior is how they earned the name “armyworm”. Their larvae (caterpillars) also cause damage to certain vegetables, such as beans, cabbage, onions, peas, sweet potatoes and more. Now is the time to be on the lookout for this tiny destroyer. What do the larva look like? Armyworms can be green or tan in color with a black head and a white mark in the center of their head. They start out very small, not causing a huge amount of damage at first. However, if left unnoticed, they will grow to their full size. That’s when they’ll do the most damage. In their last few days before turning into a pupa, they will eat about 80% of their total food intake. Seven to ten days after pupating (making a cocoon), they will hatch into a gray moth that grows up to 1.5 inches wide. How do I know if I have armyworms? The best way to protect your lawn from extensive damage to is to catch an infestation early, before the caterpillars grow too large. Because they prefer to feed at night or on cloudy days, look for them during the day in loose soil and under leaves. Chewed leaves in the garden could be a sign you may have armyworms.. Because they like extra moisture, you can help to prevent the moths from laying eggs in your lawn by cutting back on irrigation water as temperatures cool. Does your lawn look “chewed”? Give us a call or email us to set up a consultation.